The other day Japanese based exchange ZAIF announced that it was hacked on the 14th for around 5960 Bitcoin along with some bitcoin cash and MonaCoin(approx. $60mill worth at the time). 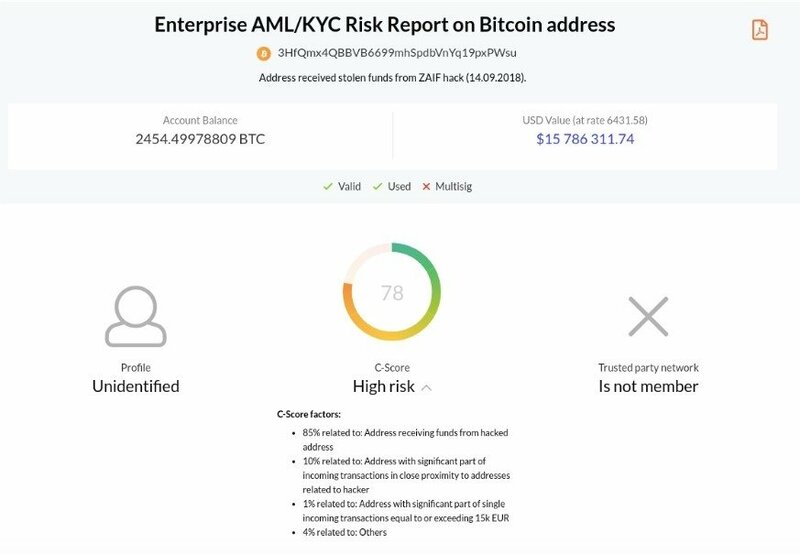 After being reported into the AMLT Network the Coinfirm and AMLT team began using the Coinfirm VIS solution to trace the flow of the stolen funds and flagged the related address in the Coinfirm AML Platform accordingly. Some funds went to the largest exchange in the world and some of them got mixed using HelixMixer, however 2455 BTC is still sitting on the address 3HfQmx4QBBVB6699mhSpdbVnYq19pxPWsu which received the funds from the original hack address. According the the AMLT Network model, once reported the data was analysed for its correctness and then once determined to be valid was implemented in the Coinfirm AML Platform with the appropriate flags and identifiers. 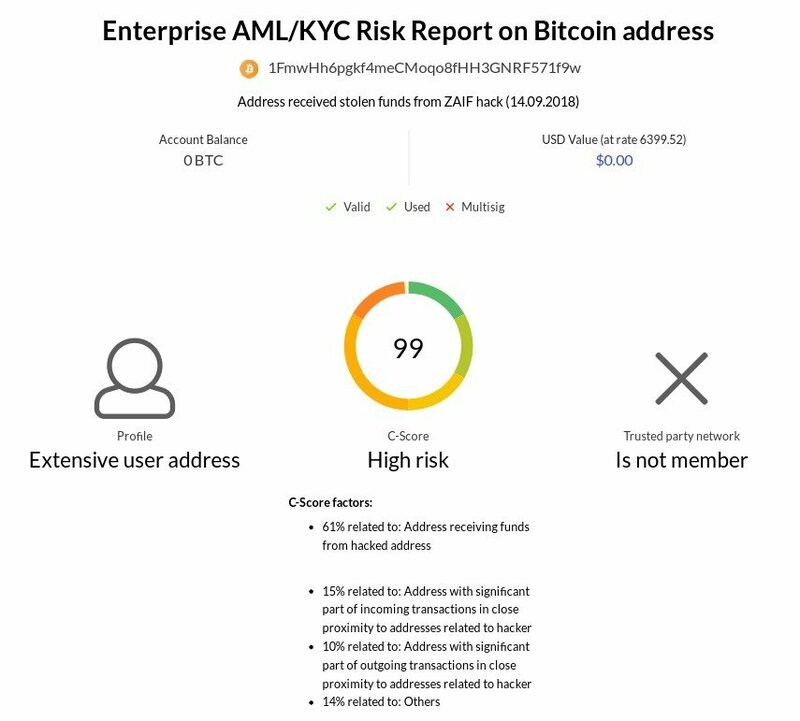 As you can see in the reports below the related addresses now have been identified as being hack related and have an elevated risk rating corresponding with the new flags and risk indicators. Now any entity who is using the Coinfirm AML Platform can prevent themselves from accepting any of the funds related to these addresses and the hack, further protecting the cryptocurrency economy and providing better safety and transparency. If the entity that reported the data to us is an AMLT Network Member, they will be rewarded for providing the data with our AMLT token that they can then use for Coinfirm solutions and services. If enough entities are using the Coinfirm AML Platform we can help fight and limit the incentive and ability of such nefarious actors from benefitting from their actions. We will be monitoring these addresses and tracking the further flow of these funds.